Our expert team of Android developers cater to clients needs in order to build custom applications on Android. Our scope of expertise includes creating android application / mobile applications, testing in a simulator, and porting to mobile devices. Android, a software platform and operating system for mobile devices developed by Google and the Open Handset Alliance, is the new craze of the Mobile application development industry. It allows developers to write managed code on Java based language that utilizes Google-developed Java libraries. The great built-in features of the Android SDK provide immense flexibility as well as opportunities to develop diverse mobile applications. This presents great profit opportunities for not only technology companies but individuals from a variety of industries as well. Whether it be in the area of sales force automation, entertainment, games, location based services or many other areas, entrepreneurs can receive high profits using Android custom application development. GSM, EDGE, CDMA, Bluetooth, WI-Fi, EV-DO, and UMTS technologies to send and receive data across mobile networks. Comprehensive libraries for 2D and 3D graphics. A wide range of libraries for image, video, and audio files, which includes MPEG4, H.263, H.264, AMR, AMR-WB, MP3, AAC, JPG, BMP, GIF, PNG, WAV, and MIDI formats. Features of Video camera, touchscreens, GPS, accelerometer, and magnetometer. P2P using Google Talk. In the recent past, functions and features of mobile phones have become increasingly more important to consumers. Mobile developers must meet these demands by designing and building powerful mobile applications. 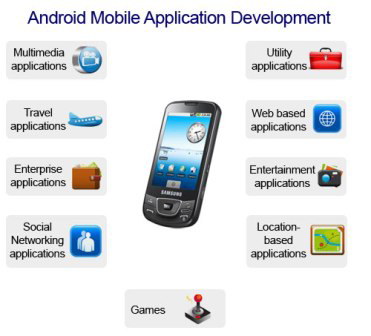 Because of its power and instinctive platform, Android App Development is the best option for developers. Almost all mobile phone companies have begun launching the category of their most developed phones, equipped with the Android application. The phones are introduced into the market as smart phone and have proven quite useful to those who cannot live without their laptop.